Still don&apos;t have plans for Carmageddon? Wondering whether to hightail it out of town or cloister yourself in your apartment with stores of canned goods, water bottles, and your own all-encompassing terror? Well, a local helicopter company would like to propose a third option: face your fears head-on. The tour — which lasts about 45 minutes — will also include other famous sites around the Southland, including Griffith Observatory, the Hollywood sign and other landmarks. 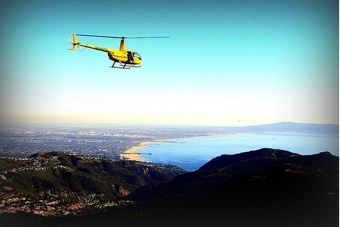 The company, which also offers tours over the Hollywood sign and Orange County beaches (among others), will make helicopter take-offs available from Whiteman Airport in L.A. or Fullerton in Orange County.